Life's Journey To Perfection: 2016 LDS Sharing Time Ideas for March Week 2: Prophets speak for Heavenly Father. March 2016 Scripture: “What I the Lord have spoken, I have spoken, … whether by mine own voice or by the voice of my servants, it is the same” (D&C 1:38). March Week 2 Topic: Prophets speak for Heavenly Father. When you are done singing the song, show the children some scriptures. 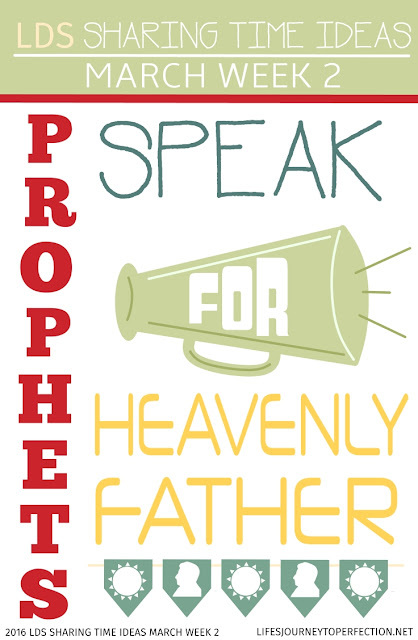 Explain that we know (learned last week) that Heavenly Father spoke to his prophets anciently and they wrote down the things Heavenly Father wanted us to know, in these scriptures. Ask the children, what about today, how do the prophets speak for Heavenly Father, to us today? Invite the primary children to share their answers to that question. Answers might include: General Conference, Church magazines, In articles on the internet or social media, Local Conferences when an apostle is present, etc. In three boxes or gift bags place in one a copy of the Friend Magazine, in another place a copy of the Ensign Magazine or Liahona and in the last place a copy of the New Era Magazine. (All of these should be available in the library. If they are not, you can go on line and print out an article from each) Invite a primary child to come up and open one of the boxes/bags and pull out what is inside. Ask the children what it is? Continue with each one, discussing each magazine. 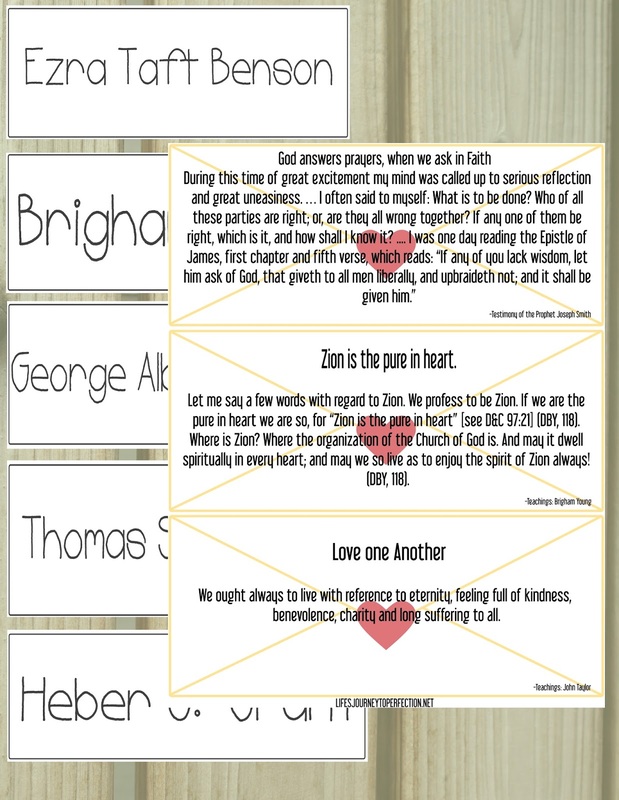 Discussion might include: Friend Magazine- in the friend magazine we can read messages from the prophets that are specifically for the primary age children. Find one of these message inside of the magazine and read some of it to the primary children. 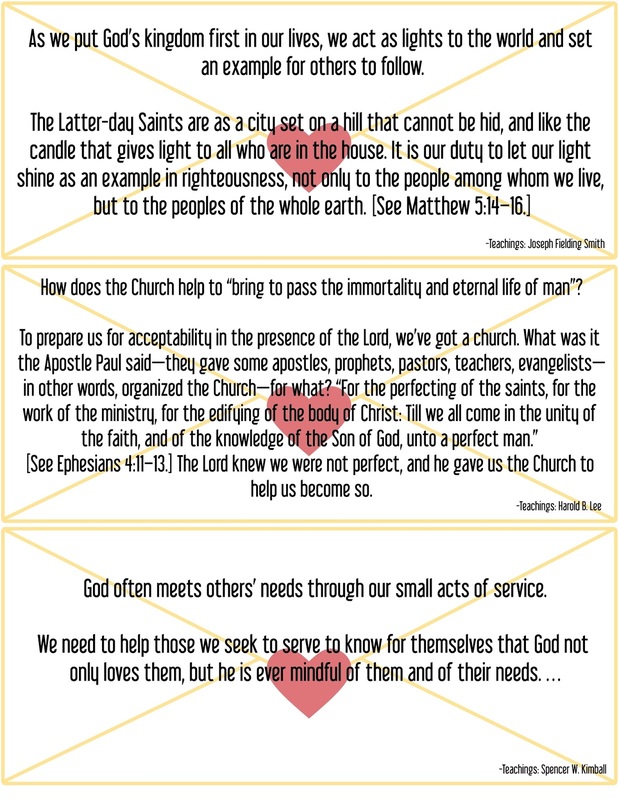 Ensign Magazine or Liahona- in the Ensign Magazine or Liahona we will find messages from the prophet, one such message that is in there each month is the First Presidency Message. These messages can help bless our families. 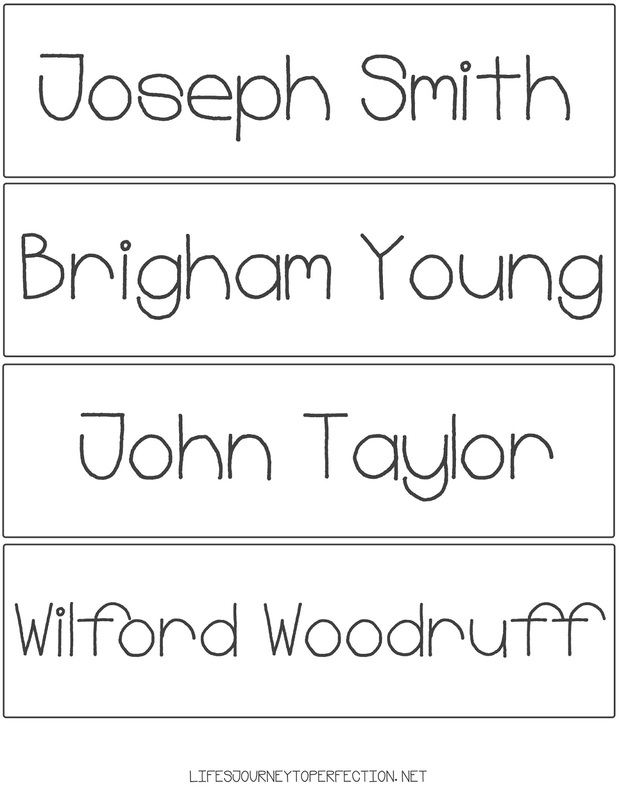 If time allows you could read some of the First Presidency Message. 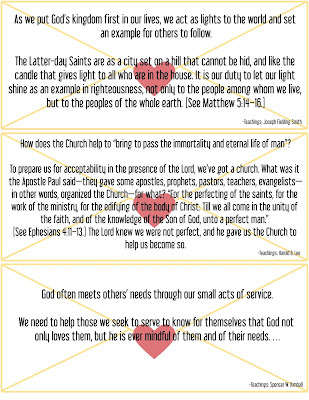 New Era Magazine- in the New Era Magazine there are messages for the youth of the church. If time allows read one of these messages. 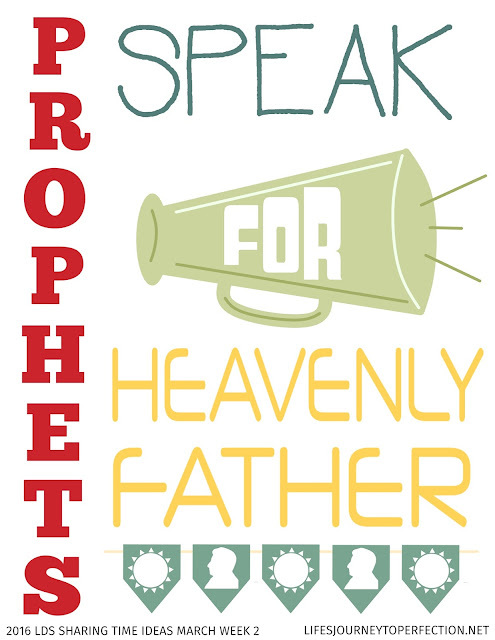 Show the primary children the month's theme poster (see above download), invite them to stand up and repeat: "Prophets speak for Heavenly Father" Heavenly Father loves us so much that he wants to speak to us and give us guidance and direction that we need right now in our lives, He does this by speaking through His Latter-day prophets. Before hand place some messages on the board (see above download), along with the pictures of the prophets and/or the names of the prophets. 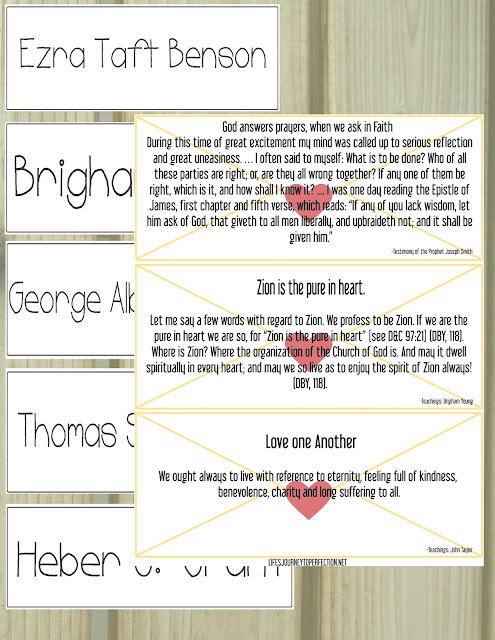 Invite a primary child to come up and choose one on the messages, invite them to read it to the rest of the primary. Then invite them to try to match it with which prophet would have said that. You may have to give them a clue such as, this prophet's last name starts with a "M". If the rest of the primary children think that it was placed by the right person have them do an action like stand up, touch their nose, or raise their hands. Continue with the messages as long as time will allow. 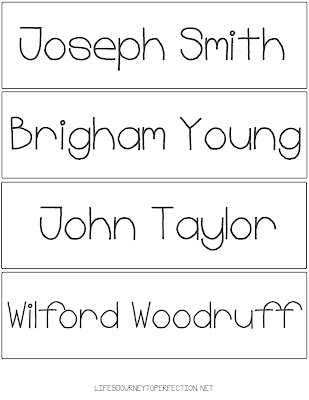 Close by sharing your testimony that even today prophets speak for Heavenly Father. Great idea! :) I love the idea of having each of the magazines in a bag and showing the children that we can read something from our Prophet in each one. Thanks for sharing! I like the way you include all the children by having them agree or disagree with the matching. Great thinking. Thank you so so so much for sharing your ideas. This is the first place I look every time I need to teach ST! Thank you! This download is great! I also gravitate toward your ST ideas and I appreciate the work you put in. Thanks!